Bolivia is named after Simón Bolívar who led the country to independence in 1825 and became its first president. Bolivia is unique in that it has two capitals - the official, constitutional capital, Sucre, where the judicial branch of government is located, and the administrative capital, La Paz, where the executive and legislative branches are located. At 11,975ft above sea level, La Paz is unofficially the highest capital in the world. Bolivia has over 30 recognized languages. The main language is Spanish followed by several dozen indigenous languages such as Aymara, Quechua, Tupi Guarani, Chiquitano, Bolivia Sign language, and Plautdietsch, an immigrant language also known as “Low German.” The main religion is Roman Catholicism and the main exports are petroleum gas, crude petroleum, zinc ore, gold, and soybean meal. In Bolivia people dress up in zebra costumes to help direct traffic for children crossing the street in major cities such as La Paz. The zebra costumes come from the word for crosswalk, paso de cebra, or “zebra crossing.” Also notable is that, in 2010, Bolivia granted all nature equal rights to humans in 2010, treating nature as a blessing that should be cared for and respected. Travelers cannot visit Bolivia without going to the incredible Bolivian salt flats, the largest in the world. The flats are so clear that they are named Salar de Uyuni, the “largest mirror on Earth. Travelers should be careful when driving on the Camino de las Yungas, a narrow, unpaved road on the slope of the Andes that is known as the world’s most dangerous road. Even though it is less than 50 miles long, an estimated 200-300 people die in car accidents here every year. Hotel(s) I Chose: I stayed at the Hotel Corona on Avenida Mariscal in Santa Cruz. It was a delightful 40 room boutique hotel in close proximity to some good restaurants, even though the hotel had one of its own. It took me about 4 weeks to get a visa for Bolivia, which I found curious, not realizing that US-Bolivia relations were strained. Here’s why they are; Evo Morales, Bolivia’s current president, started his career as a coca (cocaine) farmer, later rising to the head of the Coca Union. He later became a congressman and was instrumental in outing the US supported president of the country, who was the protagonist of the Sandra Bullock movie, “Our Brand is Crisis”. After the 2003 “War on Grass”, Evo rose to power and is currently serving his 3rd term. He petitioned the country to allow him amend the constitution, but he suffered narrow defeat due to an influence peddling scandal involving an ex-lover. During the US war on drugs, the DEA tried to eliminate coca supplies and attempted to overthrow Morales. Even though Bolivians don’t like to admit their president was a drug trafficker, countries generally don’t take kindly when the US tries to impose regime change for its own purposes. Before traveling to La Paz make sure you take Diamox for altitude sickness. The airport outside of Alto Plano is the world’s highest at +14,500 ft. Pilots flying into LPL require special training and planes need special brakes to adjust to the lack of oxygen. If you arrive thinking you’ll “adjust” or “deal” with the altitude you’ll be incredibly sorry. Even though I had begun taking Diamox two days before arriving, I still felt light headed upon arrival. Coca tea and soroche can help … but they’re no substitute for Diamox. 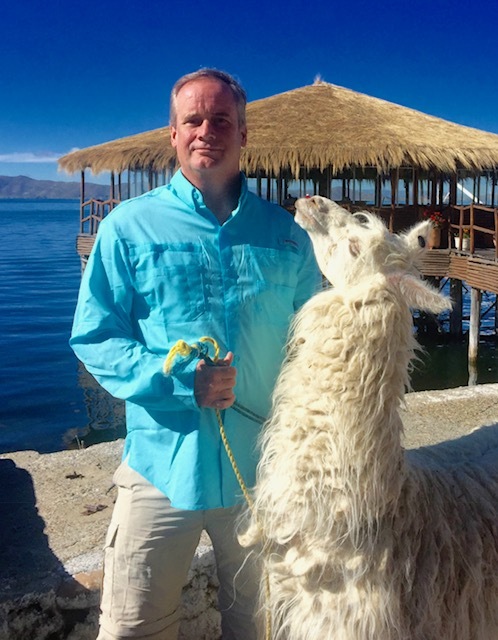 Many travelers go to the Copacabana area of Lake Titicaca but I instead chose to go to Guajataca. We took a hydrofoil (gifted by the Americans to Russia) across the river to a small indigenous community. Afterwards, I learned Yampan boat making skills and spoke at length with the community’s medicine man (witch doctors). Afterwards, we drove to the twice-weekly market in Alto Plano, which only mildly interesting as 90% of the items were US second-hand imports. Taking La Paz’s new sky cars across the city was an excellent way to see the entirety of La Paz. Spent a day with the Broyles family who lead HOPE in Bolivia. Kevin, a retired Duke physician and his wife Noelle, who was a nurse, sold all their belongings in North Carolina and moved to Bolivia to serve the poorest country in South America. 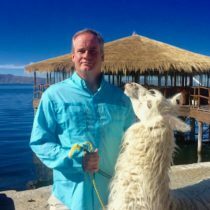 Kevin runs a clinic for wealthy Bolivians and, with the profits generated, they serve La Paz’s orphanages and the children’s hospital by providing food and clothing to the city’s poorest.